An open self-care, recovery discussion followed by a balanced yoga practice focusing on mind-body health. Groups are for individuals, friends, family & supporters. All levels welcome. 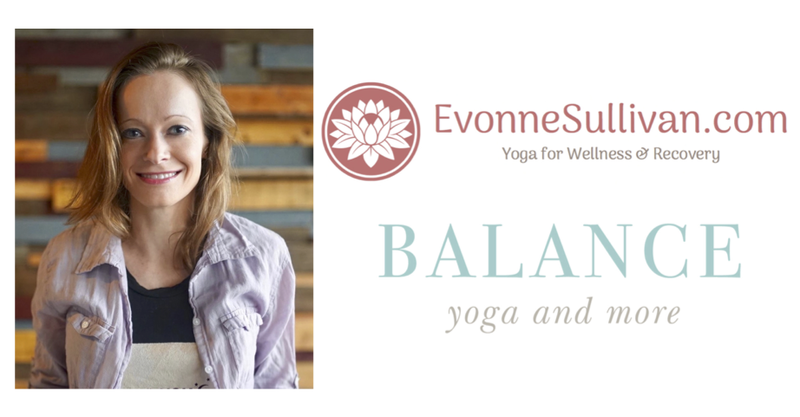 Follow this link to register for sessions at the Toronto Yoga Conference & Show. Providing Mind-Body Health breaks at the the Recovery Capital Conference of Canada - Toronto. Part I – Interactive Presentation: Through theory and demonstration, participants will learn about yoga, mindfulness and meditation for mental health and addiction recovery. The benefits of utilizing the mind-body connection will be addressed; including as a relapse prevention tool and a positive addition to a well-rounded, sustainable health plan. 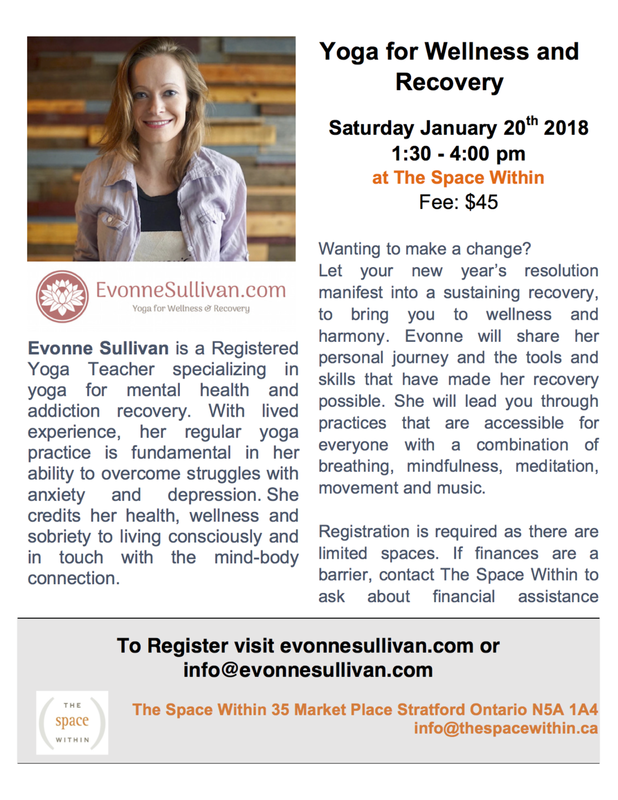 Tying together specialized trainings and lived-experience, Evonne will provide take away-tools and share her personal journey. It's Mental Health Week! 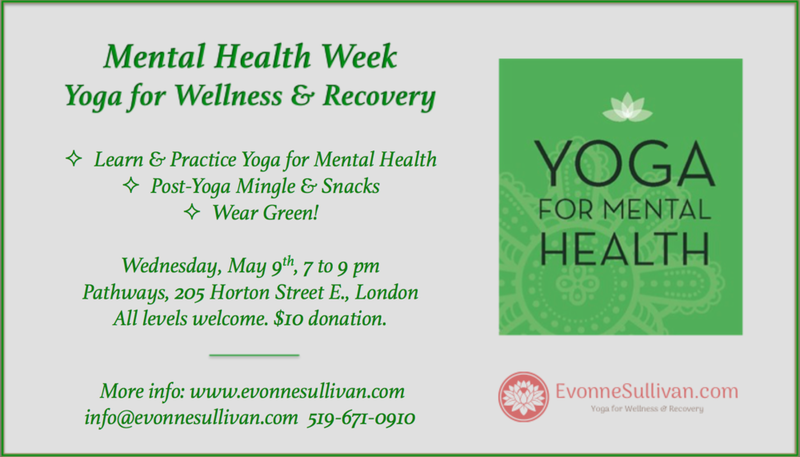 Join to learn and practice yoga for mental health (75 minutes) followed by post-yoga snacks & mingle (until approx. 9 pm). A brief overview of why yoga assists in mental health and wellness, a Yoga for Wellness & Recovery practice and the option to stay after for some snacks and chatting. All levels welcome. 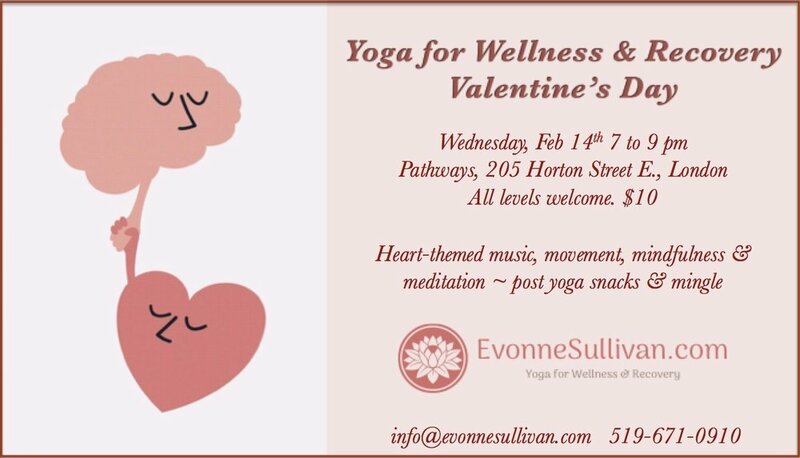 Any questions contact: info@evonnesullivan.com Feel free to bring snacks and wear green if possible! Please note: Pathways parking lot is off Clarence Street. Enter building off parking lot door. Experience presentations providing valuable, innovative workshops that will enhance, complement and expand the services and systems in place. All presentations will be focusing on our theme "Walking the Path: Finding the Way to Wellness". Our keynotes will be representing Individuals with Lived Experience, Forensic and Human Service in the Justice System. The Canadian Youth and Justice Congress - Advancing Ideas, Evidence and Innovation - will highlight Canadian provincial, territorial and international practices, innovations, research and trends that are influencing positive outcomes for youth to support a national perspective. The conference will look at the evolving youth justice system within the context of an integrated and effective social justice network. Congress 2017 will showcase preventative and innovative approaches, initiatives and research that address underlying factors that impact youth involvement in the criminal justice system. The mission of SOAAR (Secular Ontario Alcoholics Anonymous Roundup) is to bring people together to share and celebrate sobriety with friends, family and other AA members. It’s a casual recovery-based event where we can all gather to share our experience, strength and hope in a fun, friendly and inclusive environment. The Addiction Recovery Breakfast Committee of Addiction Services Thames Valley is hosting a week of events from September 11-15, 2017 that celebrate recovery in London! During the month of September, Canadians in recovery from addiction join with friends and family to build awareness, challenge societal stigma, and celebrate the role that recovery plays in improving the lives of individuals, families, workplaces and communities. Canada’s top conference devoted exclusively to workplace mental health. Since this event began over ten years ago workplace mental health has moved to the top of the priority list for organizations across the country. During this time, Canadian organizations have been helping to raise awareness, reduce stigma and provide tools organizations can use to create mentally healthy workplaces. Many workplaces are now looking to take the next step along their mental health. The Conference Board has continued to elevate the conversation through our research and this conference. She Recovers in NYC is an innovative three-day event taking place in New York City. She Recovers will gather and engage over 400 women of all ages interested in exploring a diverse range of recovery approaches that focus on mind, body and spirit. Notable and celebrated women in recovery as well as prominent leaders in inspired wellness fields will speak to and about modern recovery, sharing their unique experiences, wisdom and passion with attendees. She Recovers NYC will explore and showcase a wide array of innovative recovery strategies, resources, products and services. Mindful Psychiatry with Dr. Jose Calderon: Whole Body Mental Health Radio is a show that thinks broadly about mental health and addictions, from the mind-body connection and the gut, to the environment and the world. It seeks to broaden the discussion about mental health and addictions. WHIV FM is dedicated to Human Rights, Social Justice, and Public Health. Yoga and Spirituality for Recovery: A Symposium on Moving Beyond Addiction. Explore cutting-edge teachings on and approaches to addiction and recovery. Pioneers in the field of spirituality, yoga, and recovery will address the issue of addiction from the physical, mental, emotional, and spiritual levels. Together, we will investigate the root causes for our addictive imbalances from medical, yogic, and Ayurvedic perspectives and draw practical advice from each for holistic solutions on the path of recovery. Combine Ayurveda and yoga with traditional recovery tools for a more holistic approach to addiction and self-destructive behaviours. The course offers tools and a comprehensive approach to wellness, emotional sobriety, and sustained spiritual development using Ayurveda and yoga as extension therapies to any 12-step work. Designed for yoga teachers and health professionals who work with people recovering from addiction and for people with personal histories or family members with histories of addiction. Upon completion of the course you will have the skills to introduce the healing potential of the holistic sciences of Ayurveda and yoga into your own life and those around you.